. . . Daniel Barenboim's live Verdi Requiem benefits from a spacious recording that allows the intimate detail of the music to register, as well as the grandeur of its largest gestures. From the slow and solemn opening, too, Barenboim's interpretative view is grand in conception, with the La Scala performers offering him sufficient depth and richness of tone to paint the piece with a huge palette of colours. He's responsive to its harmonic contours . . . the four soloists form a quartet finely balanced in vocal weight and proficiency. Anja Harteros's soprano combines ethereality with substance, resulting in subtly coloured expressivity. Elina Garanca's mezzo feels perfectly scaled to the music. Jonas Kaufmann combines complete technical mastery with vivid tonal variety and commitment to the text . . . [René Pape's] vocalism is delivered on an equally empowered scale to that of his colleagues . . . this is an impressive account.
. . . Jonas Kaufmann, no less, is the ringing tenor; Anja Harteros's soprano wrenches the heart; mezzo Elina Garanca supplies warmth and cream, while René Pape's bass stands firm, a bulwark against any storm . . . [Kaufmann is] trumpeting with every note, and tender beauties are . . . floated on high. Harteros reaches her own peak in the aching loveliness of the final "Requiem aeternam", her voice the rapturous embodiment of the Requiem text's "perpetual light", while Garanca's mezzo shines throughout with a glow probably visible from outer space . . . All told, it's a thrilling account. A superb quartet of soloists . . . stamp their authority on this terrific performance. A stellar cast performing Verdi's Requiem . . . [a] line-up of superstar soloists . . . Barenboim is arguably one of the world's finest conductors -- and he's truly excellent here.
. . . this is bravura stuff, right from the opening "Requiem aeternam", the huge choir operating with maximum dynamic range before the explosive series of solo "Kyrie eleisons" lift the roof off, an extraordinary display of muscular sensitivity that sets the tone for the percussive barrage punctuating and underscoring the choral waves of "Dies irae". "This day of wrath", indeed! the performance continues at this intensity, with several standout moments before the triumphant "Libera me" sequence.
. . . an optimum line-up of soloists for our time . . . [Anja Harteros]: the German soprano . . . conveys the anxiety of the soul in torment as vividly as ever . . . Garanca's lush mezzo sounds like an Amneris in waiting in the "Lux aeterna"; Pape is a rock in the bass soloist's pronouncements . . . I wouldn't be without Kaufmann's searing "Ingemisco" and moving, introverted "Hostias". Daniel Barenboim's new Requiem . . . sounds really well. Blessed by a strong quartet of soloists [it's well worth hearing] . . . Kaufmann shows qualities as a Verdi tenor . . .
Four of the most exciting singers of the day make this into a predictably all-star recording. And with Daniel Barenboim as conductor, the performance is deeply musical, scrupulously balanced and has equally acute dynamics. The recording . . . is as clear as one could wish. The soprano Anja Harteros is superbly accurate and sings the "Libera me" with powerful emotion. But as so often, the mezzo soprano, in this case Elina Garanca, steals the honours with her moving and wonderful account of the "Liber scriptus". The tenor is the incomparable Jonas Kaufmann, who seems destined to make one think anew about everything he sings. René Pape's bass is as thrilling and reliable as ever. It's a thoughtful, considered interpretation . . . The conflict between drama and devotion at the work's centre is carefully explored but tellingly left unresolved at the close . . . The choral singing is strong . . . Soprano Anja Harteros sounds ravishing . . .
. . . [the "Dies Irae"] packs a wallop, and the Decca sound, even in two-channel, is quite spectacular. But most of all what impresses is the intense emotion of this reading, done live in Milan. The singers, to a man or woman, are superb . . . The chorus gives quarter to no one, and the orchestra has lived with this work since the premiere, knowing it better than anyone in the world. Barenboim softens some of the edges, making for a more humane Requiem, and shapes the work lovingly and with great affection . . . Barenboim implodes, seeking resolution within the core of the work as opposed to firing rockets of wrath on the audience, and the results are brilliant and thrilling . . . [this Verdi Requiem] is the best I have heard for a number of years.
. . . without an Italian within earshot (save for the orchestra and chorus), will the remarkable combination of echt-piety and Italian opera that inhabits Verdi's Requiem be well served? Indeed it is -- and it may just be a matter of how superbly the notes are played and sung, with all of Verdi's very challenging dynamic markings observed (from ppppp to fffff) and every participant on top form . . . Anja Harteros is a lovely soprano soloist, singing with authority and fine, spinto tone; Elina Garanca, freed from having to create a character on stage, uses her warm, beautiful tone . . . with ease and a wise ability to blend with the others; Jonas Kaufmann sings with long breath and a tensile strength alternating with tenderness (his "Hostias" is particularly glorious); and René Pape . . . uses his bass voice handsomely and dramatically. Daniel Barenboim goes for extremes of mood and volume and makes them all effective . . . The huge moments -- the "Dies Irae" and climax to the "Libera me" -- are spectacular. This is a Verdi Requiem to give great pleasure . . .
. . . the new bunch of soloiosts are superior. Harteros' vibrant voice can turn pure and gleaming when required and Garanca sounds marvellously rich and idiomatic. Pape is suitably imposing, intelligently singing "on the words" . . . Barenboim's grasp of long term structure makes this performance work . . . this is a dark and disturbing alternate view. All of the elements necessary for a successful performance of Verdi's large-scale masterpiece are to be found here -- powerfully expressive choral singing, expert orchestral work, insightful conducting from Daniel Barenboim, and a superb vocal quartet. Leading the team of soloists is Anja Harteros, who proves capable of sailing her radiant soprano over the vast orchestral and choral forces in climactic passages, yet able to spin out the finest thread of a pianissimo high B-flat in "Libera me" . . . Mezzo-soprano Elina Garanca's velvety tones and sensitive phrasing are exemplary, and she and Harteros render the "Agnus Dei" soprano-mezzo duet with perfect synchronization of pitch, style and articulation. Bass René Pape sings securely . . . and produces a rich, robust sound . . . Jonas Kaufmann employs his sinewy, ringing tenor to brilliant effect . . . [he] sings with a heroic quality . . . The Orchestra e Coro del Teatro alla Scala give a dynamic, first-rate reading of Verdi's score. It is a pleasure to hear such full-bodied, impassioned and well-tuned singing from the chorus -- particularly as its members prove just as adept at maintaining energized vocalism during quiet and reflective passages as they are when blowing the roof off the hall in ''Dies irae." The orchestra plays superbly under Barenboim's baton . . . Decca's sound is clear and extremely vivid -- particularly for a live recording . . .
. . . sensitive orchestral detail and stirring choruses . . .
A thoroughly Italian treatment of Giuseppe Verdi's hell-raising choral masterwork.
. . . this is as starry a lineup as any version from the Golden Age . . . It all opens well, with the La Scala chorus's mutterings of "requiem" being deliberate but genuinely hushed, and the movement builds up with warmth and smoothly contoured lines to that climatic entry of the soloists. And what a distinctive bunch they are. It is hard to be unimpressed by Jonas Kaufrnann's impassioned, rough-hewn delivery. For all the hype about him, what is not remarked enough on is how classically Latinate he can sound, stopping just short of a Gigli sob. Despite the brutal, almost Jon Vickers clenched tone, Kaufmann rides ensembles very well and respects dynamics; the "Ingemisco" is a model of subtlety. Even finer is Elina Garanca; luminous and passionate in phrasing, soulful and dramatic without resorting to chest voice, she can be rated as highly as Christa Ludwig or Fiorenza Cossotto in this work . . . The orchestra . . . sounds very plush under Barenboim. Textures are refined, yet not too blended, and they seem to respond to the dignified, if at-arms-length, approach from the podium . . . [the sound] is as full-bodied and plush as the performance, with any audience noise spookily ostracized. The notes are good too.
. . . [die Aufnahme] hat es in sich . . . ein inspirierter Daniel Barenboim [sorgt] ebenso für aufwühlende Dramatik wie für delikate Innigkeit. Vier großartige Solisten (Anja Harteros, Elina Garanca, Jonas Kaufmann, Rene Pape) singen und gestalten wunderbar differenziert, ziehen also nicht wie oft üblich eine Vokal-Show ab, sondern liefern das beeindruckendste Requiem seit 30 Jahren. Auch Chor und Orchester der Scala leisten ganze Arbeit. Exemplarisch! Das Besondere an dieser Aufnahme ist die Besetzung. Das herausragende Solistenquartett ist mit Nicht-Italienern besetzt, die aber alle mit Verdi sicher umzugehen vermögen. Die 4 Solisten harmonieren wunderbar miteinander, sie klingen edel und besitzen eher schlank geführte Stimmen. Besonders gefallen mir die beiden Frauen mit ihrer klaren und eindringlichen Stimmführung. Für Chor und Orchester ist diese Aufnahme natürlich ein Heimspiel . . . Daniel Barenboim leitet das Ensemble inspiriert und versucht zu erreichen, dass die Ensemblegruppen sich gegenseitig ergänzen, was meist gelingt . . . Wie hier der Chor fast lautlos den Text deklamiert und vom Orchester fast unhörbar begleitet wird, ist ganz große Kunst . . . [Verdis Requiem] ist ein kraftvolles, bodenständiges Werk, gefühlsstark und spannungsreich. Das kann man bei dieser Interpretation besonders eindringlich erfahren. Bei dieser von viel Dramatik getragenen Interpretation wird alles tief emotional unterfüttert, es bleibt aber immer kontrolliert. Daniel Barenboim, at the helm of opulent forces, presents a very emphatic and in a way certainly operatic Verdi Requiem. 100%-Erfreulichkeitsquote . . . Barenboim beglückt mit der besten Messa da Requiem auf CD seit Ende der 70er-Jahre . . . Auf dem Mitschnitt von zwei Konzerten . . . fügt sich einfach alles ideal zusammen. Das fängt beim ersten verhaltenen Einsatz des Chores an: So beredt und eindrücklich hört man das selten. Auch das Orchester der Mailänder Scala verblüfft mit feinem Farbspiel, genau herausgearbeiteten Stimmungen und perfekt gesetzten Akzenten. Und dann erst die Solisten! . . . Anja Harteros, Elina Garanca, Jonas Kaufmann und René Pape singen absolut hinreißend und höchst differenziert zwischen dramatischem Furor und tröstlicher Innigkeit. Ein Juwel!
. . . herausragende Solisten . . . eine kompromisslose Interpretation . . .
Er nimmt einen sofort gefangen, dieser an der Schwelle der Hörbarkeit spielende Streichersatz, gepaart mit den erstickten Stimmen des Chores, die Fürbitte um ewige Totenruhe halten . 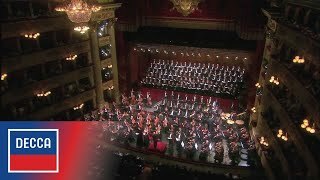 . . Kein Wunder, hatte Dirigent Daniel Barenboim mit dem Chor (Bruno Casoni) und Orchester des Teatro alla Scala sowie einem illustren Solistenquartett ein Kollektiv um sich versammeln können, das in den Mailänder Mitschnitten des Sommers 2012 kaum Wünsche offen ließ -- sofort nach dem beginnenden "Requiem aeternam" im groß angelegten "Kyrie" hörbar, in das vor allem Jonas Kaufmann urplötzlich wie eine Naturgewalt hereinbricht . . . Es folgt Elina Garancas Solo "Liber scriptus", das die Lettin mit ihrem höhensicheren und voluminösen Mezzo tadellos meistert. Im klagenden und bangfragenden "Quid sum miser" tritt dann erstmals der geschmeidige, ätherische und im Laufe der Aufnahme oftmals über allem schwebende Sopran von Anja Harteros in Erscheinung, die gemeinsam mit ihren Sängerkollegen und den mächtigen Chormassen im anschließenden "Rex tremendae majestatis" außerordentlich effektvoll um Gnade bittet. Einen kurzen Augenblick zum Innehalten und Durchatmen bieten Harteros und Garanca in der Anrufung Gottes "Recordare" . . . Einen großen Auftritt . . . legt Kaufmann im berühmten "lngemisco" hin . . . das gemeinsam musizierte "Lacrimosa" [hinterlässt] einen wunderbar homogenen Eindruck und [verfehlt] dabei seine morbide Wirkung nicht . . . Licht, beinahe heiter und vor allem balsamisch schön (Harteros) lassen dann sämtliche Beteiligten den Hörer im "Offertorio" in einer fast surrealen Welt zurück. Aber auch Jonas Kaufmann singt in "Hostias et preces tibi" schlichtweg hinreißend . . . [ein] vom Orchester traumhaft musizierter Schluss . . . Nicht zu vergessen das "Agnus Dei", das von den beiden Frauenstimmen im völligen Einklang mit dem stets famos agierenden Chor der Scala regelrecht zelebriert wird, während Garanca, Kaufmann und Pape noch einmal stimmungsvoll das "Lux aeterna" meistern. Das ergreifende Finale gehört dann freilich Anja Harteros, die im "Libera me" . . . mit einem bald überirdisch schönen, bald regelrecht fordernden Erlösungsgesuch den Hörer ebenso erschüttert wie begeistert zurücklässt.
. . . eine beeindruckende Aufführung . . . Sie ist aus einem Guss. Barenboim stand das denkbar beste Ensemble zur Verfügung. Anja Harteros' lyrischer Sopran ist glänzend fokussiert und setzt sich auch gegen große chorische Massierungen durch . . . [Elina Garancas Stimme mischt] sich mit dem Sopran sehr gut . . . [Jonas Kaufmann] beeindruckt mit einem raumfüllenden "Kyrie" und den dynamischen Kontraste des "Ingemisco": zart zu Beginn, dann mit machtvollen Phrasen . . . Die Solistenriege . . . [ist] erlesen. Anja Harteros . . . und Elina Garanca harmonieren exzellent, verschmelzen in der Unisono-Einleitungsfloskel des "Agnus Die" in vollendeter Schönheit . . . Daniel Barenboim [macht hellhörig] . . . eine tiefe Verbeugung vor einem Meisterwerk, an dem es in seiner Vielschichtigkeit immer wieder Neues zu entdecken gilt.
. . . [bei dieser Einspielung fügen sich die Stimmen der vier Solisten] klanglich und interpretatorisch blendend zusammen. Die stärksten Eindrücke hinterlassen jedoch die Solonummern. Sensationell, wie Kaufmann im "Ingemisco" seinen Tenor technisch im Griff hat, um jeden gewünschten Ausdruck herbeizuführen. Grossartig, wie Harteros im "Libera me" zwischen dramatischem Sprechgesang und lyrischer Abgeklärtheit wechselt. Obwohl alle Solisten "Nordländer" sind, bringen sie eine beeindruckende Italianità zustande. Das Orchester der Scala ist bei Barenboim in guten Händen . . . Le chef propose une lecture très impressionnante et, pour tout dire, intimidante, de cette messe. Rarement la mort a-t-elle été aussi présente sur l'ensemble de la partition ; les tempi sont justes, l'architecture d'ensemble lumineuse, les contrastes frappants ("Liber scriptus"), la partition détaillée d'une manière quasi chirurgicale . . . L'orchestre de la Scala sonne admirablement . . . le quatuor est remarquable de cohésion. Les quatre stars chantent ensemble et cela mérite d'être souligné tant on a entendu des Requiem réduits à l'enchaînement de numéros de cirque. Il est dominé, évidemment a-t-on envie de dire, par Jonas Kaufmann en grande forme. Force, virilité, nuances, articulation, souplesse, charme, il a tout et, dans son jeu subtil reposant sur son timbre cuivré, les piani légèrement détimbrés et une autorité indéniable, il est poignant ; son "Ingemisco" est une démonstration de maîtrise technique et de musicalité. Chapeau . . . Elina Garanca chante merveilleusement bien, seule comme dans les ensembles . . . [René Pape]: l'instrument est exceptionnel . . . [Le bilan d'ensemble est] excellent et ce disque évènement vient se placer très haut dans la discographie abondante de la messe verdienne. Un chef-d'oeuvre servi par un immense artiste et chef qui saisit toute la force insufflée par Verdi. Magnifique quatuor: [Jonas Kaufmann, Elina Garanca, Anja Harteros et René Pape] . . .
. . . [le] Requiem sous la direction inspirée et spectaculaire de Daniel Barenboïm avec des solistes de classe . . . Le Choeur et l'Orchestre de la Scala de Milan chauffés à blanc par le Maestro argentin aux quatre passeports, donnent à ce Requiem une vision dantesque qui fait la synthèse entre l'église et l'opéra. C'est un Requiem de luxe . . . Une affiche plus prestigieuse est, en effet, difficilement imaginable . . . choeur et orchestre de la Scala se montrent à la hauteur de leur réputation. Dès les premières mesures, attaquées dans un triple "pianissimo" quasiment irréel, l'auditeur se retrouve cloué devant son lecteur CD : quelle beauté du son, quelle homogénéité des pupitres, mais aussi quelle énergie dans les grands moments dramatiques! Barenboim nous offre une lecture majestueuse, aux tempi généralement retenus et soucieux de la moindre nuance. C'est un Requiem décidément lyrique, un grand opéra sacré, passionnant et émouvant qui se déploie devant nos oreilles. La distribution, elle aussi, est décidément lyrique : Jonas Kaufmann surtout, au chant certes musculaire dans le forte, mais capable de superbes nuances (quel "Hostias" ! ), rapproche la partie de ténor à Don Alvaro ou Radamès. René Pape, doté de moyens non moins impressionnants, s'avère un maître du phrasé verdien, offrant, lui aussi, des pianissimi digne d'un chanteur de lied. Anja Harteros et Elina Garanca enfin, en état de grâce toutes deux, nous enchantent avec leurs magnifiques solos. Mais c'est l' "Agnus Dei", où leurs voix se marient à merveille, qui reste pour nous le sommet magique de ce Requiem.